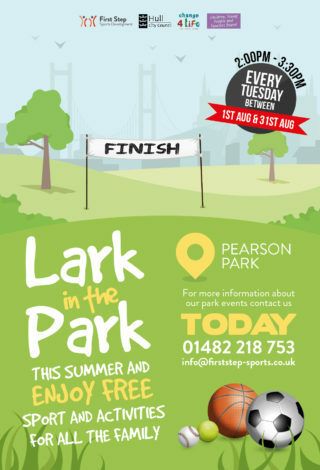 First Step Sports Development are pleased to announce that Lark in the Park is returning this summer. Thanks to our ongoing partnership with Hull City Council, Change4Life and Hull’s Children, Young People and Families Board you can now enjoy several free park events in the West area of the city. Taking place at Pearson Park every Tuesday from 1st August to 31st August between 2:00pm to 3:30pm meaning you’ll be able to enjoy free sport and activities this summer for all the family. So if you are interested in spending quality time with your family this summer trying out new sports and getting physically active, then contact us today for further information.